All snowmobile operators born after July 1, 1983, who are 12 years of age and older, must take and pass a snowmobile safety course. A snowmobile is required to have a working headlight (with a clear lens), red rear light, a windshield free from sharp or jagged edges and a fully functional brake in good mechanical condition. The snowmobile operator and any passengers are required to wear asn approved helmet and protective eye wear (face shield, goggles or glasses). Snowmobiling While Intoxicated (SWI) is strictly enforced. The legal limit is 0.08. The maximum speed limit on state land is 35 m.p.h. A frozen lake is considered a public highway and the maximum speed limit is 50 m.p.h. It is a snowmobilers duty to stop and report to local authorities any snowmobile accident resulting in personal injury, death or property damage in excess of $500. 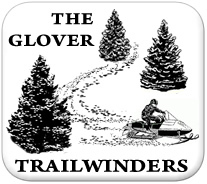 The snowmobiler must give their name, address, registration number and the name of the owner of the snowmobile to the party whose person or property is injured or damaged. A written report must be filed with the Commissioner of Motor Vehicles within 72 hours. It is illegal to operate a snowmobile that exceeds the noise level of 73 decibels on the A scale at 50 feet in a normal operating environment. A snowmobile is required to have a working headlight, red rear light, windshield free from sharp or jagged edges and a fully functional brake in good mechanical condition. At one time or another we have all gotten our sled “stuck” and had that sinking feeling when forward motion slows, the track sinks into bottomless powder and the skis point skyward. If after trying all your tricks the sled still refuses to move, here is relatively effortless way to pull the sled back on top of the snow. The only tools needed are a length of stout rope and a strong stick of wood. Tie one end of the rope to the stuck sled and then loop the rope around a strong tree or other suitable anchor. After looping the rope around the anchor post tie the other end to the sled also. Place the strong stick between the two lengths of rope about halfway between the sled and anchor. Now turn the stick like a propeller so that the two lengths of rope twist together on themselves. As you turn the stick the rope will wrap around itself and get shorter, exerting considerable force on the sled, pulling it toward the anchor tree. Tamping down the snow in front of the sled and having a friend occasionally rock the sled from side to side will aid the process by keeping the sled from plowing snow in front of it. CAUTION: The stick you are using to wind the rope will want to act like the propeller on a rubber band powered model airplane, and if you let it go suddenly it will spin just like an airplane propeller and is easily capable of breaking a finger or arm. When the sled is back on a solid footing, gradually let the rope unwind until tension on it is released, then let go of the stick.